Most of us don't like to lose flies. Well actually, none of us do. As a result, we're reluctant to risk putting them near or under obstructions. I'm no exception as I've mentioned in a previous post. 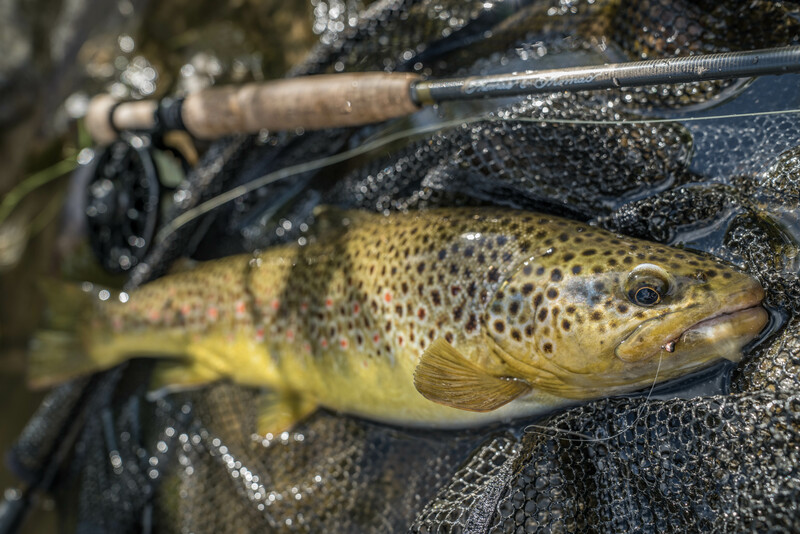 Avoiding casts around trees and bankside brush will save you some flies but it will cost you fish, especially large brown trout. One of the studies I found interesting in graduate school described the habitat preferences of brown trout and rainbow trout when allopatric (only one species in the river) or sympatric (both species in the river). In both situations, brown trout showed a predilection for proximity to cover (Gatz et al. 1987). My own fishing has certainly supported this finding. In a good brown trout river, more often than not I've found willing fish holding underneath overhanging branches. Most of the time, it takes some casting trickery to place your fly or flies where the fish are. That's why Lance, Gilbert, and I focused so much on casting mistakes and fixes at the beginning of Modern Nymphing Elevated: Beyond the Basics. It's also why we included the bow and arrow cast and the parallel kick cast. When Lance and I are teaching people on the water, we often find that we spend the majority of the day having to focus on casting proficiency when we would rather move on to other aspects but the limitations of the angler require continued casting adjustments. The best competitors can put their flies precisely where they want on the first cast the majority of the time. Most anglers we teach take 5-10 casts or more to put their flies where we want them to. By then the fish are often spooked. If the target is near or under a tree, then the risk is even greater and the rig often ends up in a branch. Given this scenario, do you think there is a connection with why trout like to live under them? I do. If you want to be better at extracting trout from under trees, the best thing you can do is master your cast until you are confident you can you can not only place your flies where you want them to land, but also control their trajectory through the air around the branch(es) you are trying to miss. Other than the bow and arrow cast, the best way to make this happen is with complete control of the parallel kick cast and related variations of oval shaped casts. If you can keep your flies tight through your leader around the oval during the stroke and control the plane of the oval, then you can do all manner of things with your flies you never thought possible. The hardest step to catching fish under branches is just getting your flies there. If you've accomplished that then the rest is often fairly easy. Let me provide an example. Two days before I left for a reunion with my wife's family a few weeks ago, I took a quick trip to a stretch of local water I hadn't fished in a while. This piece of water isn't usually known for producing very large fish but does have good numbers of fish to the 15" range with the occasional 17-18" fish when you're lucky. The fishing was consistent and I caught brown trout from just about all of the places I expected to as well as places that looked marginal at best. When I came upon the nice run in the picture below, I caught fish out of the tail and near side as I slowly worked my way up the run. By the time I got to a position to fish the juicy looking head of the run, I had already landed 8 or 9 browns including some nicely built fish in the 14-16" range in this run alone. The head of the run certainly promised more fish but before I made any casts there I knew there was at least one fish waiting under the tree branches extending from the bank in the middle of the photo. I tried several casts skirting around the tip of the branch and caught a fish but the branch extended so far from the bank that there was a lot of water I hadn't covered closer to the bank. Given how low the branch was to the water, there wasn't room to get the sighter under the branch with a traditional dead drift. In this case, I decided it was better to get my nymphs there with any possible presentation than with no presentation at all. I made an oval cast with the plane of the back cast diagonally upward behind me to clear the flies around the branch and angle them low and toward the water on the forward cast where they would avoid the branches beyond on the bank as well. I stopped the drift with my rod tip before the sighter reached the overhanging branch and allowed them to swing under. On the second drift under the branch I kept the rod tip moving downstream after the swing had begun to extend the flies further downstream and toward the bank. I received a hard take that I was lucky not to break off and all hell broke loose. The fish ran all around the run and jumped five times. I used every angle and pressure trick in my book but still expected to lose the fight on the 6x Cortland Fluoro tippet I was using. The tippet held and somehow and the largest trout I've seen in this stretch of the river in years made it to the net. Most of us would expect a top end trout to require a perfect drift and presentation to catch, especially in a river like the one I was fishing that receives a good amount of pressure. However, most fish under trees rarely even see flies given the difficulty of getting them there in the first place. As a result, they are willing to take a variety of flies and presentations. The main challenge is showing your flies to the fish. If you can meet this challenge, you've got a better than even chance of getting them to take. 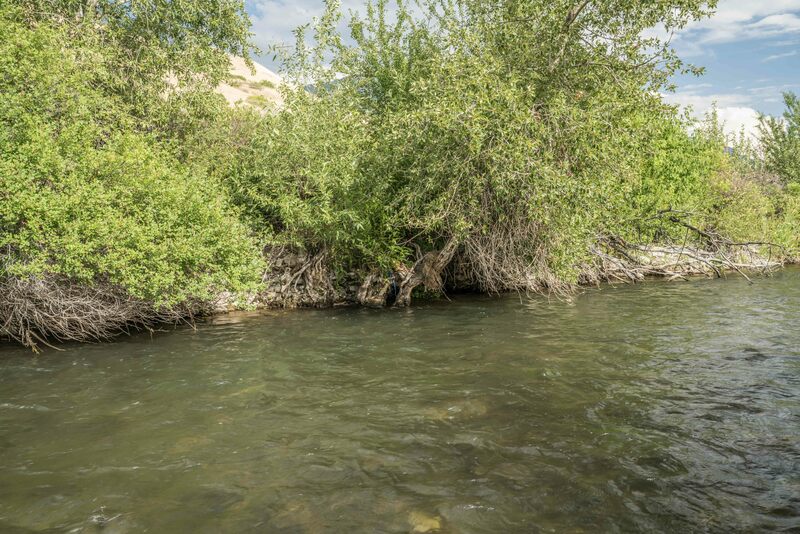 Next time you're on the river, if you want a shot at the best trout of the day or possibly your season, find a location on the bank with overhanging structure that looks likely it will hold fish. If you aren't used to casting to these types of places, take a minute and analyze your positioning and which location will give you an angle to make some sort of cast to the target. Then make a couple of practice casts that land intentionally short of the target to make sure you are comfortable with how the rig is behaving on the cast. Then give it a shot. The worst thing that can happen is you'll have to wade over and get your flies out of the tree or you'll lose them. But the upside of taking the risk could be a trout that stays in your memory for a long time. Gatz, A. J., et al. “Habitat Shifts in Rainbow Trout: Competitive Influences of Brown Trout.” Oecologia, vol. 74, no. 1, 1987, pp. 7 to 19., doi:10.1007/bf00377339.